Our son has been taking guitar lessons for the last 2 years, he hated it at the beginning but now he has that guitar in his hand almost as much as his xbox controller. Not long ago we were given the opportunity to review the Semester 1 bundle, with the absolute beginner course from Guitar 360 Method. While he isn’t a beginner guitar player I thought that it would be good for him to get some extra practice in. As an extra bonus our oldest thought the program looked pretty awesome and has recently started the beginning course herself. 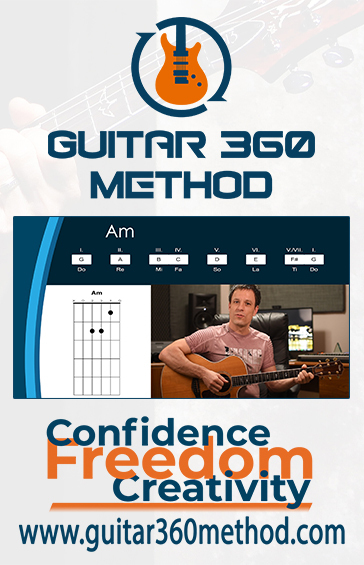 The goal of the Guitar 360 Method is to instill creativity and confidence in beginning or intermediate guitar students. The program will give it’s students a solid foundation for learning to play guitar and offers a simple method to understand chords, scales, music theory, and ear training. Kris Simonfalvi is the resident guitar teacher, his patient and detailed explanations help you to feel like you are right in front of him and not just staring at a computer screen. One of the things that I appreciated right away about this program is that it doesn’t assume you know anything. The first week of lessons teaches you everything you know about the basics. My son was able to skip right over this week of lessons but it was perfect for my daughter who never even held the guitar previously. If you begin at the beginning you get 18 weeks of self paced videos that will help you move from beginner to Rockstar… or you know, at least campfire player. The video quality is top notch, and the camera zooms to the fingers on the strings when there needs to be a closer explanation. As any good music teacher, Kris teaches his program in a way that each lesson builds on one another, and he circles back to important concepts as reminders and to hone in on a skill. There is the perfect blend of fun and music theory, but as my kids have figured out, it’s just as challenging as any in-person music class you might take. The program includes, worksheets, quizzes and practice sessions to help you along the way. So my son, who isn’t exactly known for his humble nature, jumped right into this thinking it was going to be a piece of cake. He started with the bonus songs and right away was frustrated. But he is not one to give up so he spent a week working on “Don’t stop Believing” by Journey. His initial feeling was that Kris was moving to quickly through the lesson and he became frustrated that he had to keep “rewinding” to get down the right strings. He eventually did get the song though, and plays it on his own now. My thoughts on this are that he really just wasn’t ready for that song and would have had better success had he moved through some of those earlier lessons. But eh… teenage boy. Here is a sampling of him practicing the beginning part of the song. My daughter however began at the beginning and although she was late in the game to get very far into the program before me writing this, has already learned so much and feels like the pace is perfect. This program is ideally for your middle school/teenager and older. While some younger students might have success, you will probably have to spend more time with them, keeping them on task, making sure they are following along correctly and helping them hold the guitar appropriately. Check out what other Reviewers thought of the program by clicking below! I am also passionate about playing Guitar and thanks for the free course. It’s not easy to learn Guitar by yourself but I think your course will help me to learn new things. I really like the way you explain all the information in great way.